You never see italian recipes using Salmon. The fish just isn't traditionally used. 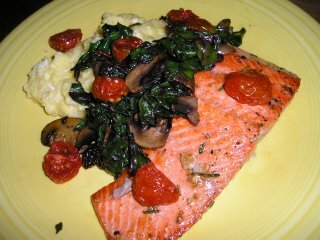 But here I was with a notion for an italian style vegetable saute served over polenta and some Salmon. So I roasted with Salmon with olive oil, rosemary and garlic. It went perfectly fine with my side dishes.